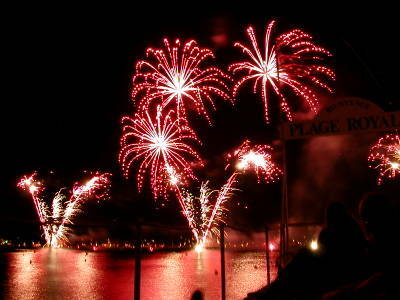 Tonight was Pyromélodique & Pizza in Cannes once again for a continuation of the Fireworks Festival. As I mentioned before, each week of the Festival proves to be more crowded than the week before. 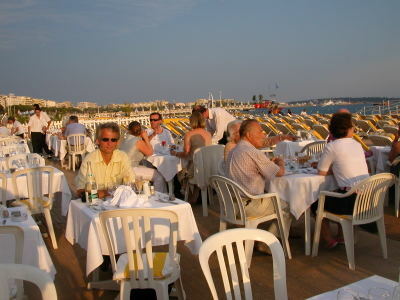 The line for dinner at La Pizza, along the old port of Cannes, was the most crowded we’ve ever seen it. We waited in an unruly line of people for about 45 minutes to get a table on the terrace. 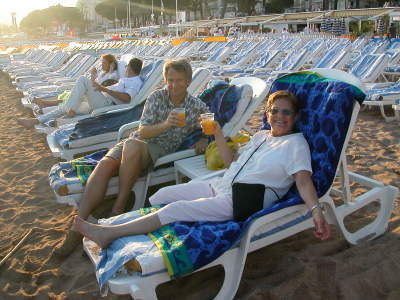 By the time we got to Plage Royale to rent our beach chairs, there was no place on the beach with three chairs together, so they put us (Dave, Monique, and I) on the ponton (a pier on pontoons), which juts out into the Bay of Cannes. Dave and I had always wondered how it was possible to get seated on the ponton, so we were pretty excited to have finally gotten the privilege of sitting there. It turns out that the seats were pretty good, however, we thought the seats on the beach were actually better because they faced straight out over the water, whereas, the ponton seats faced out on either side, so you had to turn your head to one side to get a good view of the fireworks. Il est important de croire qu’il y aura toujours de par le monde, des Roméo et Juliette !!! From the Nice-Matin daily newspaper - "Antibes: Mariage Fabuleux pour un Milliardaire Russe. Un jeune Russe multimilliardaire de 33 ans se marie aujourd’hui au Cap d’Antibes. Parmi ses invités, on trouve le président Russe Vladimir Poutine et plusieurs de ses ministres. Whitney Houston, Julio Iglesias et Christiana Aguilera sont présents pour un concert très privé." Apparently, our invitation to the wedding of the young 33-year old Russian multi-billionaire must have gotten delayed in the mail, so we were unable to rub elbows with the likes of Vladimir Putin and several of his ministers; and we missed the very private concert performed by Whitney, Julio, & Christiana. However, we were able to enjoy the laser show and the fireworks display from the terrace of our apartment two nights in a row. We hope that Andreï Melnichenko and his lovely bride, Alexandra, will provide a repeat performance here in Antibes at their first-year wedding anniversary. 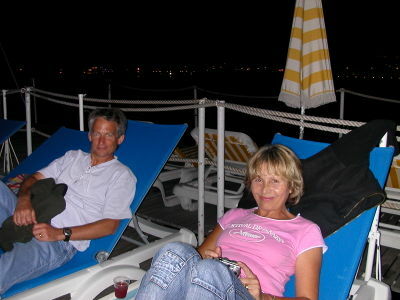 The last night of the Fireworks Festival in Cannes found us at our regular pizza joint, La Pizza, with Allan & Diana Colby. While we were having dinner on the terrace across from the old port, we were able to catch glimpses of the parade taking place in front of us in honor of the 61st anniversary of the liberation of Cannes (and the rest of the south of France) in World War II. There are many streets in the south of France named “Rue du 24 Août” or “Avenue du 24 Août” after the celebrated event of 1944. The parade consisted mostly of U.S. military tanks and trucks with men dressed as American soldiers in their WWII camouflage uniforms, and vintage black cars with “FFI” written on the sides and carrying the French flag with the Cross of Lorraine in the center. The FFI, which stands for Forces françaises de l'intérieur (or French Forces of the Interior), was formed as the result of the unification of different movements of resistant fighters. Under the command of Général Pierre Kœnig, its goal was to liberate the départements of France, starting in the south and heading north to Paris. 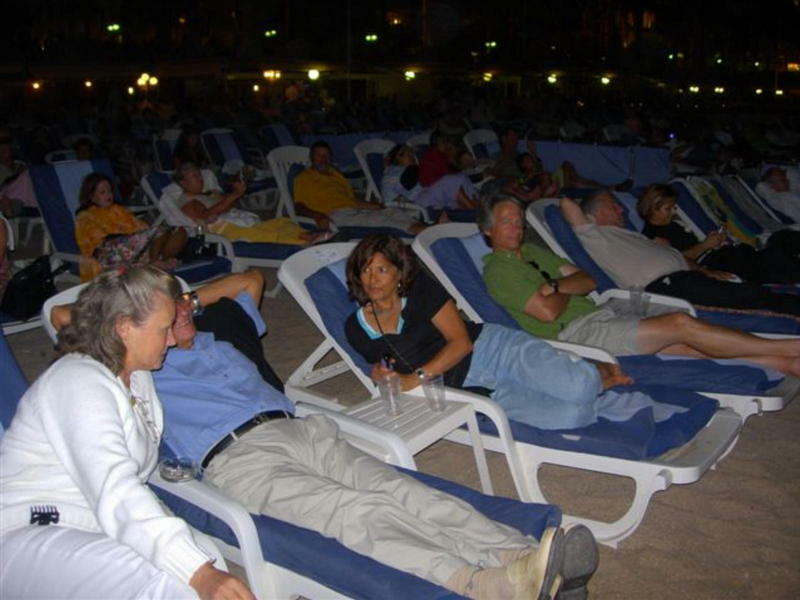 We made ourselves comfortable in our beach chairs on Plage Royale, sipping a bit of champagne, while awaiting the sound of “2001: A Space Odyssey”, which signifies the start of the spectacle. 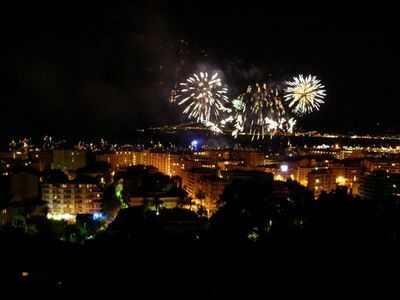 France was the official host of tonight’s fireworks, which were not part of the competition. Their theme was “Lacroix-Ruggieri: Hommage à la Russie”. We had to wait until the end of the show, which was quite outstanding once again, to find out the winner of “La Vestale d’Or”. It wasn’t easy to understand the announcement, and it wasn’t until we read it in the newspaper the next morning that we knew for certain that it was France who came in first, and Spain who came in second. Dave and I got to Cannes by train in time to go to the Musée de la Castre, which sits on the very top of Le Suquet (the old town of Cannes). The museum occupies what remains of a medieval castle overlooking the Croisette, the bay of Cannes, and the Iles de Lérins. It is a small museum with the majority of the contents of the museum consisting of a collection of ethnological and primitive art, along with some fine arts from the 19th- & 20th-centuries by painters from the region of Cannes and the Cote d’Azur. It also has a collection of about 200 musical instruments from Asia, the Pacific, Africa, and Central America called “Musiques du Monde”, which is exhibited in the 12th-century Saint-Anne Chapel. I found it very interesting to see some of the paintings by Ernest Buttura such as “Vue d’Antibes” and “La Croisette en 1876”, and to be able to recognize them and see that they were not all that different from what they are today in 2005. It was also fun to see a painting that I believe was called “Rue de la Boucherie”, depicting the windy street in Le Suquet that we had just climbed to get to the museum – and, except for the clothes of the people and the dead chickens on the steps, it didn’t look any different back in the 1800’s than it did today when we climbed up it. Yet another evening of fireworks. 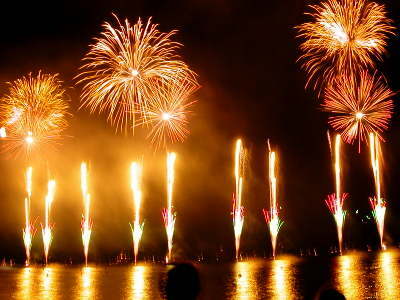 This time we just walked over to Juan-les-Pins and had another special “Menu Feu d’Artifice” at Restaurant Hélios on the beach. The menu was quite good, and the fireworks presented by Québec were good too. They lasted about 20 minutes and were very fast and furious. The whole 20 minutes was like one long finalé. In France they call the finalé of the fireworks “Le Bouquet”, which is a much more imaginative and perfect description, don’t you think?